Sitting on the large, gated community of Terra Verde is this three bedroom courtyard villa. 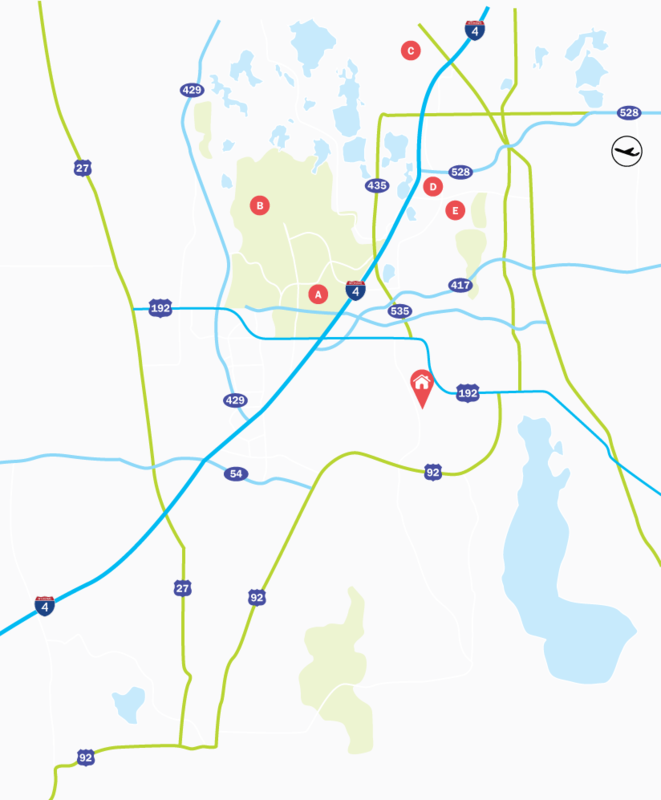 Located just off the Kissimmee end of the US192 means that the Disney theme parks and plenty of entertainment are just a short drive away. Queen-size bed, slide closet, ceiling fan, TV. En-suite bathroom contains shower cubicle, sink, WC. Queen-size bed, slide closet, TV. Twin beds, slide closet, TV. Family bathroom located next to bedroom 3 contains shower over bath, sink, WC. Cloakroom located next to the kitchen contains sink, WC. Located on the east side of the US192 in Kissimmee, is the large gated community of Terra Verde where you will find this three bedroom courtyard villa with a completely private outside dining area, as well as plenty of community facilities for the whole family to enjoy. Disney theme parks are just a fifteen minute drive away. Living Accommodation - As you enter the property, immediately to the left of the front door is the well-equipped, open-plan kitchen with a breakfast bar seating two people. Adjacent is the formal dining area with seating for four people. At the back of the townhouse, adjacent the dining area is the family lounge with sofa, a loveseat, a flat-screen TV and patio doors to the outside seating area. Bedrooms - The Master bedroom is to the right of the stairs on the first floor and has a Queen-size bed and an en-suite bathroom. Bedroom 2 is to the left of the stairs on the first floor and has a Queen-size bed. Bedroom 3 is next to bedroom 2 and has twin beds. Outdoor Living - The completely private patio has an outdoor dining table with seating for four people. Terra Verde is a large, picturesque gated community with a mixture of 350 villas and townhouses built in 2004. Located just off the US192, nearby is the famous Old Town of Kissimmee. Disney is around a fifteen minute drive with Universal and SeaWorld no further than thirty minutes away. Debbie's Villas is a proud member of ABTA (Association Of British Travel Agents) and our ABTA number is Y5238. We are ABTA PROTECTED. We are also ATOL PROTECTED, Licence Number 11188.